Pierre Abélard (in English, Peter Abelard) or Abailard (in English, Peter Abelard) or Abailard (1079 – April 21, 1142) was a preeminent French scholastic philosopher, often referred to as the “Descartes of the twelfth century” due to his rationalist orientation, and regarded as a forerunner of Rousseau, Kant, and Lessing. He was one of the greatest logicians of the Middle Ages, and one of those who believed that ancient pagan philosophy was relevant to Christian thought. He was one of the first to introduce the methods and ideas of Aristotle to Christian intellectuals, and helped establish the scholastic tradition of using philosophy to provide a rationale for ecclesiastical doctrine. A formidable polemicist, he was rarely defeated in debate because of his keen intelligence, excellent memory, eloquence, and audacity. Abelard is regarded by later scholars as one of the founders of “nominalism.” He also anticipated Kant by arguing that subjective intention determined if not the moral character at least the moral value of human action. The story of his tragic love affair with his student, Héloïse has become a romantic legend. Pierre Abélard was born in 1079, in the little village of Le Pallet, about 10 miles east of Nantes, in Brittany (France), the eldest son of a noble Breton family. The name Abaelardus (also written Abailardus, Abaielardus, and in many other ways) is said to be a corruption of Habélardus, substituted by Abélard himself for a nickname, "Bajolardus," given to him at school. His father, Berengar, was lord of the village; his mother’s name was Lucia. As a boy, he learned quickly, and, choosing an academic life instead of the military career usual for one of his birth, acquired the art of dialectic (a method of philosophical inquiry), which at that time consisted chiefly of the logic of Aristotle transmitted through Latin channels and was the main subject of liberal study in the Episcopal schools. The nominalist Roscellinus, the famous canon of Compiegne, claims to have been his teacher; but whether this was in early youth, when he wandered from school to school for instruction and exercise, or some years later, after he had already begun to teach, remains uncertain. 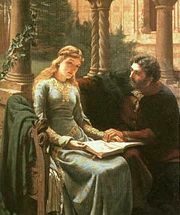 Abelard and his pupil, Héloïse, by Edmund Blair Leighton. Abélard's travels brought him to Paris while he was still in his teens. There, in the great cathedral school of Notre-Dame de Paris, he was taught for a while by William of Champeaux, the disciple of Anselm of Laon (not to be confused with Saint Anselm) and most advanced of the Realists. He was soon able to defeat the master in argument, resulting in a long debate that ended in the downfall of the philosophic theory of Realism, until then dominant in the early Middle Ages, and its replacement by Abélard's Conceptualism, or by Nominalism, the principal rival of Realism prior to Abélard. In the face of opposition from William of Champeaux, at the age of only twenty-two, Abélard set up a school of his own at Melun, then moved to Corbeil, nearer Paris, in order to compete more directly with him. His efforts at teaching were notably successful, but the work placed too much strain on his health and he had to give it up for a time around 1101. He spent several years recuperating in his home town, “almost cut off from France,” as he recalled. On his return to Paris, after 1108, he found William of Champeaux giving lectures in a monastic retreat outside the city, and there they once again became rivals. Abélard was once more victorious and stood supreme. William was only temporarily able to prevent him from lecturing in Paris. From Melun, where he had resumed teaching, Abélard went on to the capital, and set up his school on the heights of Montagne Sainte-Geneviève, overlooking Notre-Dame. From his success in dialectic, he next turned to theology and attended the lectures of Anselm at Laon. His triumph was complete; without previous training or special study, he was able to give lectures which were acknowledged to be superior to those of the master. Abélard was now at the height of his fame. He stepped into the chair at Notre-Dame, being also nominated canon, arout the year 1115. Distinguished in figure and manners, Abélard was seen surrounded by crowds; it is said, by thousands of students, drawn from all countries by the fame of his teaching. Enriched by the offerings of his pupils, and entertained with universal admiration, he came, as he says, to think of himself as the only undefeated philosopher in the world. In his devotion to science, Abelard had always lived a very regular life, enlivened only by philosophical debate: now, at the height of his fame, he encountered romance. Living within the precincts of Notre-Dame, under the care of her uncle, the canon Fulbert, was a girl named Héloïse (born about 1101). She is said to have been beautiful, and was remarkable for her knowledge, not only of Latin, but of Greek and Hebrew. Abélard fell in love with her; and he sought and gained a place in Fulbert's house. Becoming tutor to the girl, he used his power for the purpose of seduction, and she returned his devotion. Their relations interfered with his public work, and were not kept a secret by Abélard himself. Soon everyone knew except the trusting Fulbert. Once her uncle found out, the lovers were separated, but continued to meet in secret. Héloïse became pregnant, and was taken by Abélard to Brittany, where she gave birth to a son called Astrolabe. To appease her furious uncle, Abélard proposed a marriage, kept secret in order not to mar his prospects of advancement in the church. Héloïse opposed the idea, appealing to him not to sacrifice the independence of his life for her sake, but reluctantly gave in to pressure. The secret of the marriage was not kept by Fulbert; and when Héloïse boldly denied it, life was made so difficult for her that, at Abélard's bidding, she sought refuge in the convent of Argenteuil. Immediately Fulbert, believing that her Abélard, who had helped her run away, wanted to be rid of her, plotted revenge. He and some others broke into Abélard's chamber by night, and castrated him. The priesthood and ecclesiastical office were, thereby, canonically closed to him. Héloïse, not yet twenty, at Abélard's jealous bidding that she never again share romantic love with a man, became a nun. Abélard, now aged forty, sought to bury himself as a monk in the abbey of Saint-Denis. Finding no respite in the cloister, and having gradually turned again to study, he gave in to urgent entreaties and reopened his school at the priory of Maisonceile in 1120. His lectures were once again heard by crowds of students, and all his old influence seemed to have returned; but he still had many enemies. As soon as he published his theological lectures (apparently, the Introductio ad Theologiam) his adversaries criticized his rationalistic interpretation of the Trinitarian dogma. Charging him with the heresy of Sabellius in a provincial synod, held at Soissons in 1121, they obtained, through irregular procedures, an official condemnation of his teaching. Abelard was made to burn his book before being shut up in the convent of St. Medard at Soissons. It was the bitterest possible experience that could befall him. Life in the monastery was intolerable for Abélard, and he was finally allowed to leave. In a deserted place near Nogent-sur-Seine, he built himself a cabin of stubble and reeds, and became a hermit. When his retreat was discovered, students flocked from Paris, and covered the wilderness around him with their tents and huts. He began to teach again and found consolation; in gratitude he consecrated the new Oratory of the Paraclete. Abélard, fearing new persecution, left the Oratory to find another refuge, accepting an invitation to preside over the abbey of Saint-Gildas-de-Rhuys, on the far-off shore of Lower Brittany. The region was inhospitable, the domain a prey to outlaws, the house itself savage and disorderly, but Abelard persevered in this post for ten years. When Héloïse's convent at Argenteuil was broken up, he was able to establish her as head of a new religious house at the deserted Paraclete, and often visited in the capacity as spiritual director. Héloïse had remained faithful to her vows. Some time after leaving the Abbey of St Gildas, Abélard wrote his famous Historia Calamitatum, moving Héloïse to write her first Letter, which remains an unsurpassed utterance of human passion and womanly devotion. This was followed by the two other Letters, in which she finally accepted with resignation, the life which, as a brother to a sister, Abélard commended to her. Abélard soon returned to the site of his early triumphs, lecturing on Mount St. Genevieve (where he was heard by John of Salisbury in 1136), but only for a brief time. During his Paraclete days, his chief enemy had been Bernard of Clairvaux, who represented the principle of fervent and unhesitating faith, and to whom Abélard's rational inquiry was sheer revolt. The uncompromising Bernard moved to crush the growing evil of rationalism by attacking Abélard as the boldest offender. After preliminary negotiations, a council met at Sens in 1141, to hear Abélard, who had been formally arraigned upon a number of heretical charges, plead his cause. When Bernard opened the case, however, Abélard suddenly appealed to Rome. Bernard, who had power to get a condemnation passed at the council, did not rest a moment until a second condemnation was procured at Rome in the following year. On his way to Rome to present his appeal in person, Abélard collapsed at the abbey of Cluny, where he lingered only a few months. His friends, in order to relieve his suffering, moved him to the priory of St. Marcel, near Chalon-sur-Saone, where he died. His remains were buried first at St. Marcel, then carried off secretly to the Paraclete, and given over to the care of Héloïse, who in time came herself to rest beside them (1164). Their bones were moved more than once afterwards, but they were preserved even through the vicissitudes of the French Revolution, and now are presumed to lie in a well-known tomb in the cemetery of Père Lachaise in eastern Paris, though there seems to be some disagreement as to their actual resting place. The Oratory of the Paraclete claims that Abélard and Héloïse are buried on their site and that what exists in Père-Lachaise is merely a monument. According to Père-Lachaise, the remains of both lovers were transported from the Oratory in the early 1800s and reburied in the famous crypt on their grounds. Others who believe that while Abélard is buried in the tomb at Père-Lachaise, Heloïse's remains are elsewhere. The general importance of Abélard lies in his establishment of the scholastic tradition of using philosophy to give a formally rational expression to received ecclesiastical doctrine. Though his own particular interpretations may have been condemned, they were conceived in essentially the same spirit as the general scheme of thought afterwards elaborated in the thirteenth century with approval from the heads of the church. He initiated the ascendancy of the philosophical authority of Aristotle during the Middle Ages; before his time, Realism relied on the authority of Plato. Aristotle’s influence became firmly established in the half-century after Abélard’s death, when the completed Organon, and later all the other works of the Greek thinker, came to be known in the schools. Abelard contributed to the development of argumentative methods by adopting a method of inquiry called Sic et non ("Yes and no"), which presents two contradictory views of authority and highlights the points of disputes. Abélard had a great influence on his contemporaries and the course of medieval thought, but he has been known in modern times mainly for his connection with Héloïse. It was not until the nineteenth century, when Cousin (1836) issued the collection entitled Ouvrages inedits d'Abélard, that his philosophical performance could be judged first-hand. Previously only one of Abélard’s philosophical works, the ethical treatise Scito te ipsum, had been published, in 1721. Cousin's collection, besides giving extracts from the theological work Sic et Non ("Yes and No") (an assemblage of opposite opinions on doctrinal points, culled from the Fathers as a basis for discussion, the main interest in which lies in the fact that there is no attempt to reconcile the different opinions), includes the Dialectica, commentaries on logical works of Aristotle, Porphyry and Boethius, and a fragment, De Generibus et Speciebus. The last-named work, and also the psychological treatise De Intellectibus, published apart by Cousin (in Fragmens Philosophiques, vol. ii. ), are now considered upon internal evidence not to be by Abélard himself, but only to have sprung out of his school. A genuine work, the Glossulae super Porphyrium, from which Charles de Rémusat, in his classical monograph Abélard (1845), has given extracts, was published in 1930. Anselm of Canterbury was the representative thinker of the “Objective” branch of Middle Age philosophy, while Peter Abelard was the representative of the “Subjective” branch. “Objective” means the unconditional acceptance of the given objects of the Bible, tradition and authority as the truth. “Subjective” means interpretation of these objects of faith by the individual in the context of personal experience. Abelard’s last theological foe was Bernard of Clairvaux, who denounced some of Abelard’s treaties as well as to his approach to matters of faith. Bernard regarded philosophers as agents of Satan. He condemned Abelard of promulgating a heretical doctrine of the Blessed Trinity. 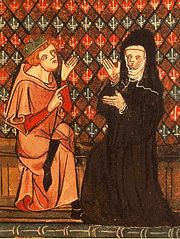 In order to resolve the difference between their theories, Abelard asked the archbishop to arrange a public dispute between them on June 3, 1140, which never took place. In this debate, both Abelard and Bernard were taking the “Subjective” position; Abelard using reason and Bernard using mysticism to explain the Trinity. 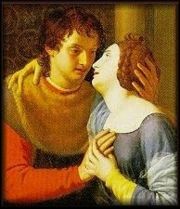 Abelard was widely known for his love affair with Heloise, to whom he wrote a number of love letters. Historia Calamitatum (Story of My Calamity) was written as an autobiography and confession; when compared with Augustine’s Confessions, the differences are evident. Augustine’s Confessions describes events in terms of Augustine’s relationship with God. Abelard’s autobiography describes his personal feelings and reactions to events. The word “Calamity” (in the title) itself implies a subjective attitude. This type of autobiographical confession is a very early example of the type of self-examination that took place during the Renaissance and the Enlightenment. Apart from his dialectic, Abélard’s greatest contribution was in ethics. His thought in this direction is remarkable because his scholastic successors hardly ventured to bring the principles and rules of conduct under pure philosophical discussion, even after the great ethical inquiries of Aristotle became fully known to them. Abelard’s philosophy and ideas anticipated by several centuries the philosophers of the Renaissance and even the Enlightenment. He anticipated Kant in arguing that the subjective intention determined if not the moral character then at least the moral value of human action. Abelard also emphasized the role of conscience, considering it as the ultimate guide and final judge. Later, Immanuel Kant and other Protestant thinkers developed this idea into religious individualism. Abelard studied under William of Champeaux (1070-1120), the disciple of Anselm of Laon (not Saint Anselm) and the Realists. William of Champeaux was one of a number of famous teachers of logic, rhetoric, grammar and theology, and helped to build the schools which became University of Paris. However, he suffered a heavy defeat in the dispute with young student Peter Abelard over the reality of universals, and afterward most of his students shifted to Abelard instead. Finally, William of Champeaux was compelled to change his own theory. Their discussion was over the reality of universals, or “the problem of universals.” John of Salisbury (1115-80) regarded this as a problem which could not be resolved by the human mind. The origin of this inquiry appears to have been the Eisagoge (Isagoge) of Porphyry (c.232-c.305), a Greek philosopher. Eisagoge was a short introduction to Aristotle’s Categories that became a famous standard textbook during the Middle Ages. Boethius (c.480-525/6) translated the Eisagoge to Latin and wrote a commentary on it. Porphyry debated whether the individual characteristics that distinguished each species were living existences which would exist whether a person thought of them or not, or whether they existed as ideas alone. This work initiated the noisiest controversy of the philosphy of the Middle Ages. It became known as the problem of universals. It concerned the relationship between the abstract concepts in our mind and specific things. For example, what is the relationship between the concept of a lily and a specific lily blooming in the field? The realists supported Plato’s theory that universals were realities (in Latin, res) with a real existence apart from the particulars in which they are substantiated. This viewpoint prospered from the ninth to the twelfth centuries, and was held by John Scotus Erigena and Anselm of Canterbury. William of Champeaux, after studying at Paris and Laon, studied under Roscelin at Compiegne. However, William of Champeaux adopted the very opposite thought to that of Roscelin, and taught ultra-realism. Abelard studied under William of Champeaux and later debated him. Roscelin’s thought was termed “nominalism.” As most of his writings have been lost, except for a letter to Abelard, one can only rely on the comments of Anselm, Abelard, and John of Salisbury, who testified that Roscelin was an opponent of ultra-realism. According to Anselm, Roscelin thought that the universal is a mere word (flatus vocis). Nominalism held that universals were just names (in Latin, nomina), and that the individual is the only actual existing substance. When carried to extremes, neither realism or nominalism could be justified satisfactorily. Peter Abelard suggested a more reasonable form of nominalism. He accepted Aristotle’s explanation of the universal, but he asserted that it is not a thing which is signified, but a name. This reflects the nominalist view of Roscelin, under whom Abelard had studied. One cannot immediately suppose, however, that Abelard rejected any reality corresponding to the universal word. He seemed to accept that there is a reality corresponding to the specific words. Abelard made the further distinctions of vox and sermo. Vox implies the word as a corporeal existence (flatus vocis), a thing. Sermo refers to the word in relation to its logical content, and it is this which is stated. Abelard asserted that correspondence among specific things justified the use of universals for building knowledge. Thomas Aquinas and Duns Scotus preferred a less excessive realism, which refused the view that universals exist apart from the individual entities to which they refer. Abélard later wrote the words and melodies for over a hundred hymns for the religious community that Héloïse joined. Melodies that have survived have been praised as "flexible, expressive melodies (that) show an elegance and technical adroitness that are very similar to the qualities that have been long admired in Abélard's poetry." The Letters of Abelard and Heloise, translated by Betty Radice, 1972, ISBN 0140442979. Time Jesum Non Riventum, translated by Betty Radice, c. 1970. Clanchy, Michael T. Abelard: A Medieval Life. Blackwell Pub., 1997. ISBN 0631205020. Marenbon, John. The Philosophy of Peter Abelard. Cambridge University Press, 1997. Mews, Constant J. The Lost Love Letters of Heloise and Abelard. Perceptions of Dialogue in Twelth-Century France. St. Martin Press, 1999. Mews, Constant J. Abelard and Heloise. Oxford University Press, 2005. This page was last modified on 14 March 2019, at 16:19.